The Society was founded in 1912 by a handful of local men seeking good local sport, when membership of the Society was 5 shillings a year. 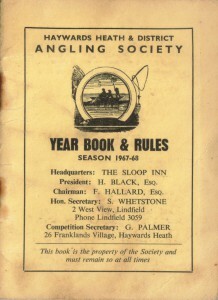 Since then, it has grown into a Society that owns several stretches of the Sussex Ouse and with a membership that spans several counties and runs into the hundreds. Besides the Sussex Ouse, stretches of which the Society controls from Lindfield down to Goldbridge at Newick, a total of almost 9 miles, the Society also offers excellent fishing on several local still waters ranging in size from 1 acre to about 14 acres. Our waters contain most species of British freshwater fish: Brown Trout, Grayling, Barbel, Tench, Pike, Common Carp, Crucian Carp, Roach, Rudd, Bream, Perch, Chub, Dace, Gudgeon, Eel and occasionally Rainbow and Sea Trout. The Society has three large and two small lakes, situated within easy reach of Haywards Heath and the M23 corridor. The lakes vary between 1 and 14 acres and offer the angler a variety of quality fishing deep in the heart of the Mid Sussex countryside. All the large lakes contain most species of fish, which range from double figure Common Carp and Pike, to quality Tench, Crucian Carp, Roach, Perch, Bream and Rudd. Large bags are not uncommon. The smaller lakes tend to contain mainly Common or Crucian Carp together with the odd Tench, Roach,Rudd, Perch and Gudgeon. The Society controls and maintains a variety of stretches of the Sussex Ouse over a 12 mile length, from above Lindfield road bridge, then on down through East Mascalls, past the Sloop Inn at Freshfield, and stopping just short of Sheffield Park. It then continues again opposite Sheffield Park station and continues for about a mile below the road bridge. At Fletching the Society controls the upstream section, North Bank , for about a mile. Finally at Goldbridge, east of Newick, the Society has the rights to fish upstream, for about a mile and a half. The Sussex Ouse varies in depth, alternating between deep and shallow runs along its length. The river runs parallel with parts of the old Ouse Canal, which is also fishable. The Sussex Ouse contains all species of freshwater fish including quality Chub, Dace and Bream. The occasional Common Carp can be found in the slower stretches with Pike also showing. The Sussex Ouse has a natural head of native Brown Trout and the odd Sea Trout can also be found. The Sussex River Authority introduced the first Barbel several years ago. These fish, now being caught to 16lb with an average size of 6 to 8lb and can be found in all our waters from below Pimms lock at Lindfield to Goldbridge. The Sussex Ouse passes through some of the prettiest countryside in the Mid Sussex region, and offers superb fishing, especially for the discerning angler. If you are interested in becoming a member, then please contact our acting Membership Secretary, Mr Edward Winton on 07747 868 323 or info@hhdas.com .